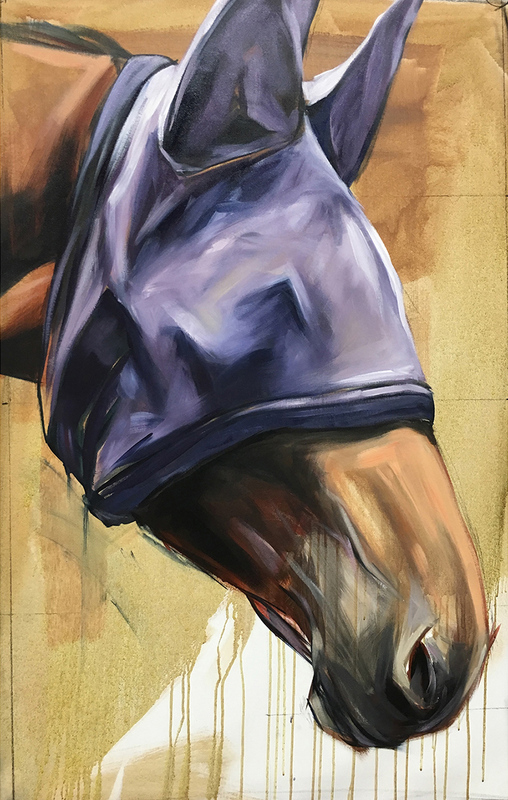 New 2016 Equine Series: "Fly Masks"
This week I’m both proud (and wee bit nervous) to share something different with you: the beginnings of a new series of work called "Fly Masks." Fly masks, though odd looking things, actually help protect the horse’s face and ears from pesky, biting, disease spreading flies and insects. Especially in the summer months. If you know how annoying one or two flies buzzing around your face can be, imagine if you had no hands to wave one hundred flies away, and you get an idea of what a horse might go through, sans mask. And if you happen to be wondering, just like I was, the answer is yes—the horse can indeed see through them because they're made of mesh. I'm using the masks here as a more universal symbol for protecting oneself from excessive, outside "irritants and distractions." Something that helps invite small doses of calm and focus into one's life. 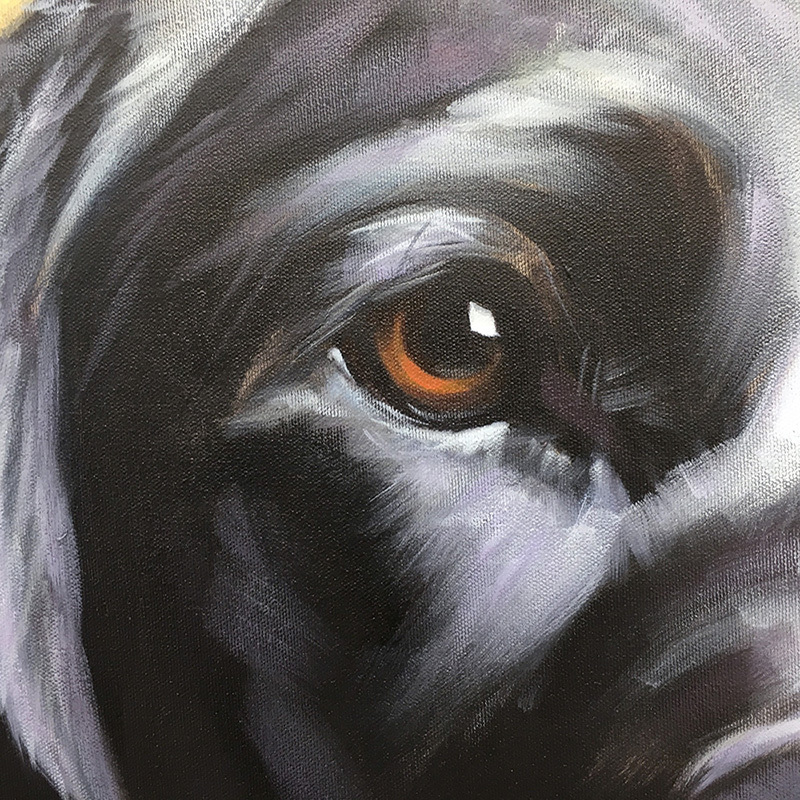 A few weeks ago, I challenged myself to completely leave the comfort and familiarity of doing detailed animal eyes and faces, and attempt to create an animal portrait that was (hopefully) still compelling. I basically removed what I’ve been told is the heart of my work for the last 15 years—the animal's expression—to see what developed in it's place. No biggie. Just a little artistic terror. But that's exactly why I did it. It's become crystal clear to me that the only way to grow as an artist is to continually push myself outside the line of what I know. Even though the urge to scurry back into the familiar is a weirdly strong one. So I'm proud of this work precisely because I resisted that urge. A few more pieces are in the works. If you'd like to sign up for my newsletter, the next round will be sent straight to your inbox. This is new a portrait of a rescue horse named Jake, who lives at Rancho Relaxo animal sanctuary. I'm really enjoying work on Mylar lately. It forces me to work very quickly which seems to result make for a stronger result. The quicker I paint, the more decisions come from my gut and not my head. Always a good thing. 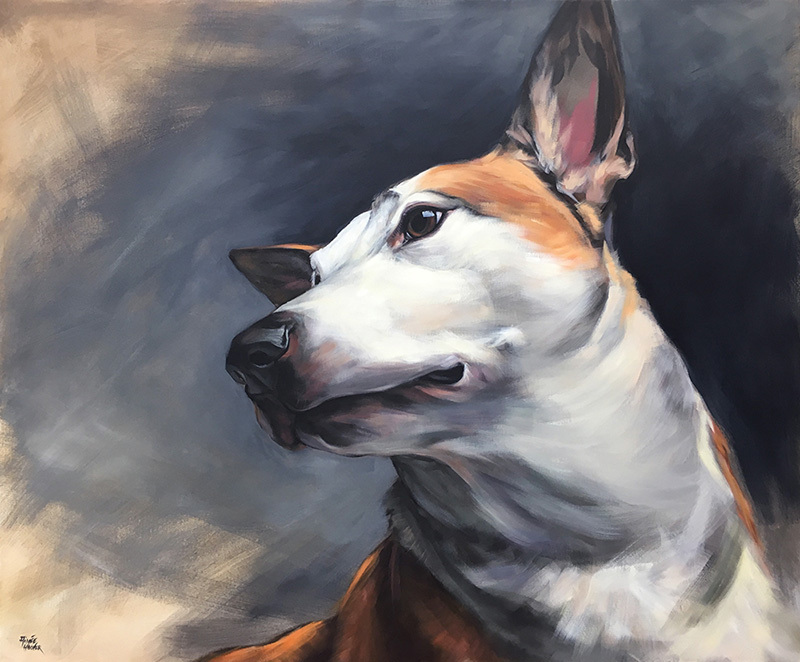 If you're interested in this painting, a portion of the proceeds will go to Jake's non-profit home, Rancho Relaxo, to help them care for Jake and their menagerie of rescue animals. I've been experimenting with painting on matte Mylar lately. Matte Mylar is a basically a sheet of semi-transparent plastic, typically used as drafting film. Painting on this surface requires that I work VERY quickly, as the drying time seems to be cut in half. 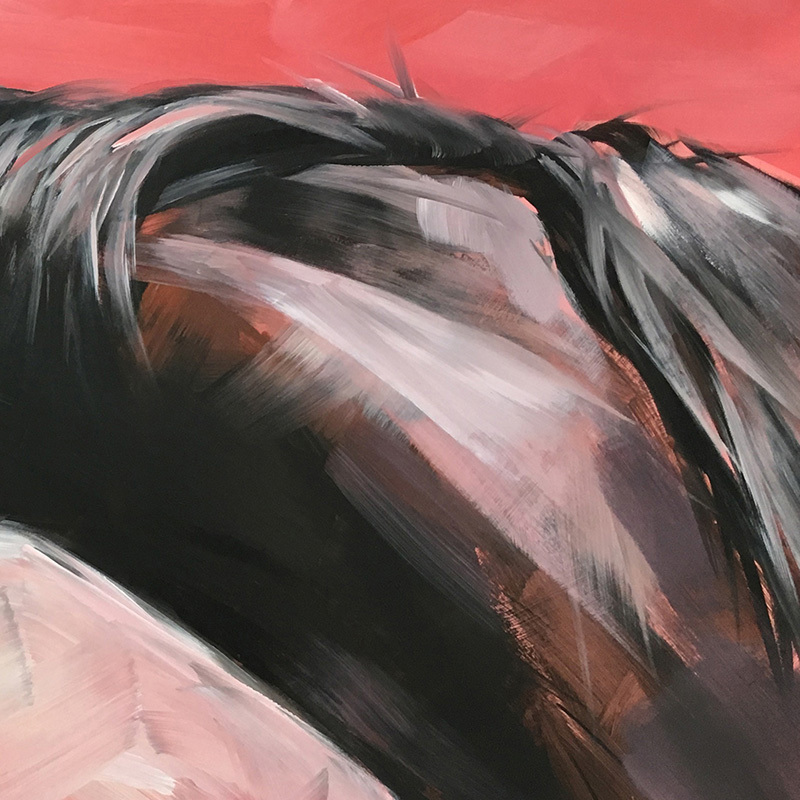 Right now I'm trying to get away from tightly rendered paintings that record every little detail, and move towards more painterly, gestural work—with smaller pockets of more refined brushwork. Working quickly aids me in this quest because the paint drying time sort of precludes working at the slower speed all that detail requires. But it allows me enough time to still work in a realistic style...just not straight up "realism." Mylar also forces me out of my own head...where all my little negative, judge-y thoughts live, since there's not a whole lot of time to second guess myself. Which is a great bonus. Especially when 1.) the client happens to be awesome, 2.) 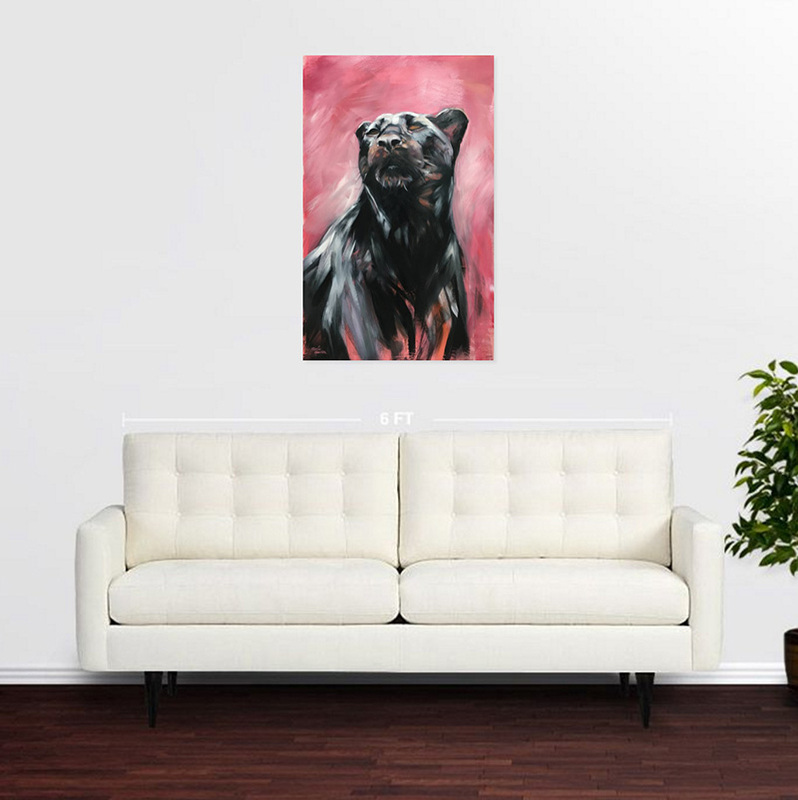 I get to paint from fantastic images by renowned pet photographer Amanda Jones, and 3.) the request is for multiple, large-format paintings...so it's like creating a mini body of work. I've also always wanted to do custom work for a restaurant. And on a personal note, it turned out that my client, Jennifer, went to the exact high school I would have gone to had my family stayed in Michigan and not moved to California the summer before I hit 9th grade. Needless to say, I jumped at the chance when the opportunity came my way. I hope to get the chance to paint more work for restaurants as the experience was so great all around. In the meantime, if you find yourself in Michigan you can check out the pieces in person at Tucker's of Northport (Northport, MI). All content copyright ©2017 Aimée Rolin Hoover. Any and all unauthorized usage of content constitutes copyright infringement.